NORWICH, CT- For the first time since moving to Norwich, the Connecticut Tigers are rebranding with a new hometown team name - and are asking for help from the fans. The Tigers are giving the community a rare chance to help name their team in an online "Name the Team" opportunity. "As we head towards the 25th season of Minor League Baseball here in Norwich, we want the fans to help decide what the future will look like at Dodd Stadium," said Connecticut Tigers General Manager Dave Schermerhorn. "What better way to kick off a new era of Minor League Baseball in Norwich than by having our fans help determine a name that will be representative of them and our community?" Fans are encouraged to visit cttigers.com and submit their suggestion for the team's new identity, along with an explanation of why they feel their suggestion perfectly embodies our community. The top choices will be released this summer for community input and voting. 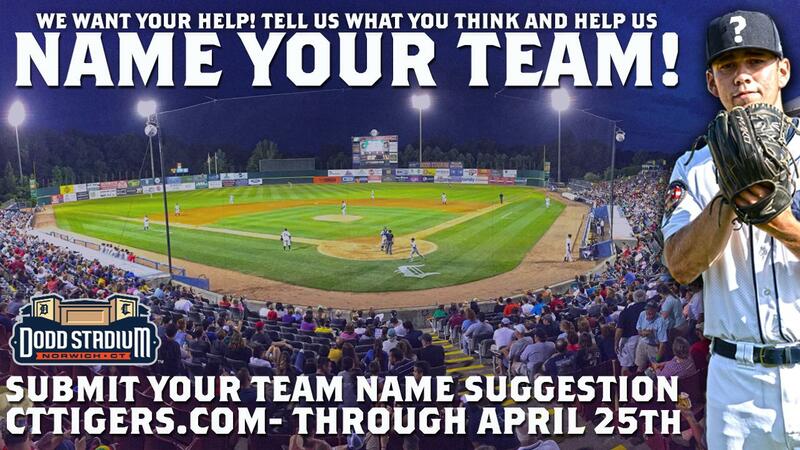 The name suggestion process is now open on cttigers.com, and runs through April 25th. The winning name will be announced later this year. The Tigers are collaborating with Brandiose on the new look, who helps make teams famous by celebrating their hometown stories. Partners Jason and Casey dreamed up top selling logos for the El Paso Chihuahaus, Rocket City Trash Pandas and America's oldest baseball club, the Cincinnati Reds. The Tigers previously teamed up with Brandiose on the 2013 New York-Penn League All-Star Celebration logo, Dodd Stadium logo and New England Lobster Rolls logo. The Connecticut Tigers are the New York-Penn League affiliate of the Detroit Tigers at Dodd Stadium in Norwich, Connecticut. 2019 season memberships for "The Club", mini plans, and team merchandise are now on sale! The 2019 season at Dodd Stadium kicks off on Sunday, June 16th at 7:05 pm with fireworks after the game. The front office and box office are open daily from 9 am to 5 pm Monday through Friday and can be accessed in person or by calling 860-887-7962.